After the initial analysis and defnition of rules, all staff members benefit from the simplified data maintenance. Data, e.g. descriptions, order information for Purchasing, product descriptions for customs etc. are consistent, comprehensive and transparent. The interface of the Text Generator is easy to use and self-explanatory; the tool will therefore be readily accepted and used within the business. Retrieval of information is facilitated significantly. Staff members have more time for their actual core tasks. Complete information facilitates daily work: e.g. external information in Purchasing (make-or-buy), internally in Design or in Assembly. The different departments in the business have worked with different, non-standardized text in creating and maintenance of their data over the years. This leads to unstructured, inaccurate or incomplete values for material masters, geometric details for parts and purchased components, BOMs, data sheets, commodity groups and many more are in CAD, ERP or PLM systems. If translations are required, they have to be added manually adding to the workload. Working with this data causes frustration and unnecessary costs. Due to the inaccurate data, you are at risk of making the wrong decisions. The existing data needs to be ”cleaned“, meaning: cleansed, adding a viable structure and missing details. ”Cleansing data“ is one of the core tasks for simus systems in more than half of the projects and is carried out competently by the software module ”classmate DATA“. At first, we are taking stock of the data, then define rules, which standardize, cleanse and add missing details to the data. As a result, we create a database, which makes it easy for staff to find what they are looking for, as well as an excellent basis for all connected systems. Geometric data from CAD models can be classified automatically (through the software ”classmate CAD“). simus systems even holds the patent to it. Data entry of new data needs to be at a high level; a process needs to be established. A thorough data revision is a requirement for the application of ”classmate Text Generator“. It is using the database and puts meaningful texts together according to their specifications for various purposes – order information for Purchasing, data sheets, product descriptions for customs to name a few examples. 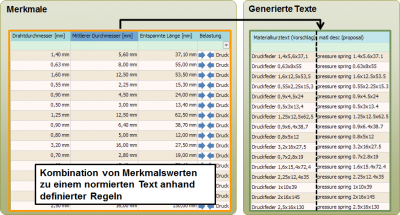 And the best part: It is automated and up-to-date at all times due to the structured data! The established processes can be adapted by the user at any time. Translations can also be supported by automated text. As a matter of course, interfaces to ERP systems, such as SAP® are also integrated. simus systems is an expert for the efficient handling of technical mass data. 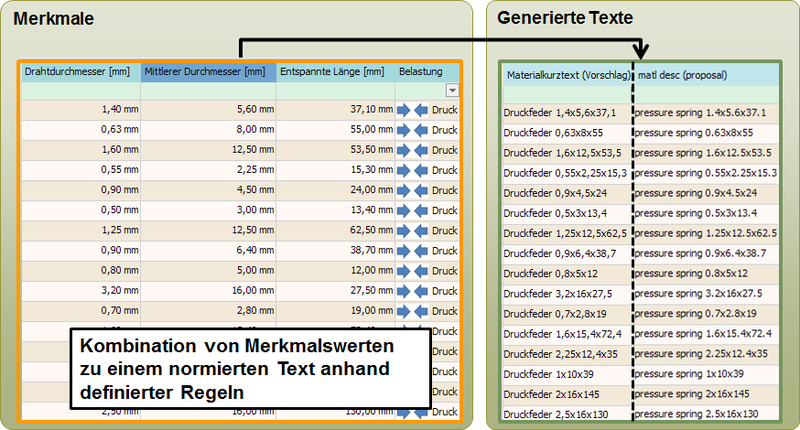 Would you like to request more information on simus classmate text generation? Give us a call or send us an email! We are looking forward to it.